This is a story about plains, along the meanders of Po river. A new adventure for us too. Always dealing with wood, in cabinet making, sculpture and artistic restoration, I obviously knew bog oak. It is called a semi-fossil wood: not yet fossil, but on the way to become it. It is well known for pipes making, it is also used for luxury furniture and furnishings. While participating in international fairs, we recently met a company that sells bog oak, at staggering prices. In that moment I connected some intuitions I had and decided to deepen a research that I had started a long time before. I knew that in the world peat bogs, where bog oak can be found, are very rare, usually in New Zealand, Ireland and Eastern Europe. In Serbia and Croatia 8000 years old bok oak can be found, in the marshes along the Danube valleys and its tributaries. You can’t find information about Italian bog oak, at least on the internet. By the way I had talked to people who live near the Po and who told me about very heavy and dark woods that sometimes are found after the floods, submerged in the river bed. We knew enough to start a new adventure! Typical characteristics of the wood change in bog oak, as the lignin is replaced by inorganic substances, just in a sort of petrifaction process, which occurs in the absence of oxygen and light, in peat lands and marshy areas. As the centuries go by, the wood becomes harder and harder, darker and darker, or lighter, depending on the type of soil, while it also lets its perfumes go (this is the reason why it is excellent for pipes making). In this state it is possible to find pine, yew and oak, very hard wood that resist in water. Putting together information and contacts we organized a real search, in the heart of the Po valley. We went several times on the Po at the and of summer. We were greeted by friends and special collaborators in quiet villages of low houses, poplars, large willows and still some old oaks, in an atmosphere that reminded us of adventures of Tom Sawyer along the Mississippi. We also took a boat tour, seeing the plants and waterfowl, the majestic heron laid just above our heads, immersed in the silence, without trace of people for miles. We will not forget the excitement of the find, the size of the old semi-buried tree, the chainsaws that cut with difficulty, the weight of the pieces to be transported and loaded. At first glance our trunk did not seem to belong simply to an old oak tree. Back home we took him to cut into tables by our collaborators, who had never seen anything like it. After several months of seasoning, preparing it to make the first prototypes of jewelry, I realized that working that material was different … everything confirmed my intuitions about his age. For the final confirmation we had to wait again, the time of the chemical analyzes we had requested on a sample. The most precise analyzes are the Carbon 14, which confirmed that the trunk can be dated back around 1500 years before Christ. 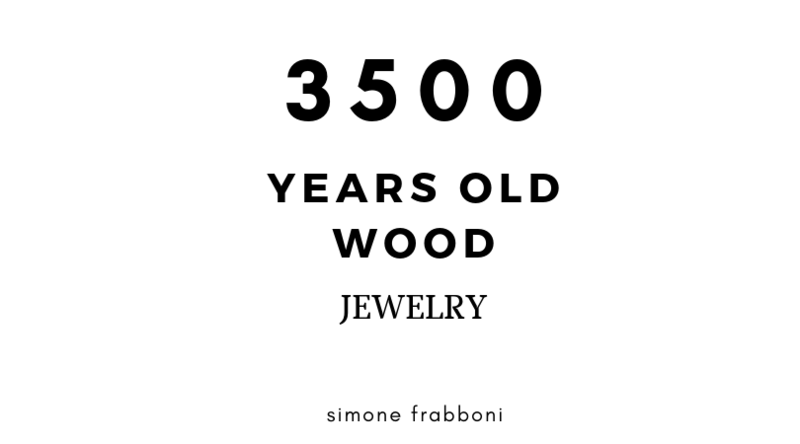 So we have the certification that our bog oak is 3500 years old. Without considering the hundreds of years that a tree of that size could have already lived. It was the time of ancient Egyptians, before the foundation of Rome (753 BC), before there were kings and borders throughout Europe, this oak was already there. In the silence of an imposing, immense forest that covered whole Europe. Now we have a witness, a fragment of another world that now appears a little closer, a bit more real. Also because we did not buy it on the internet: for us it is not a product, but an ancient tree that the waters have transported and kept for centuries, until we could find it. To enhance such a particular material, we thought of a first collection of jewelry with a very minimal style, with the contrast between a neutral base and bog oak, which stands out just like a precious stone. In the rings we have decided to combine this rare wood with an acrylic resin, without polluting solvents, according to its ecological significance, the one that a 3500 year old oak can whisper to those who can listen. Finally we have completed our long journey! On the shop you can find the first pieces in limited series, which we called “3500”.